Several different ways to set the table exist, from very formal to casual; rolled silverware bundles generally fall into the more casual side of table etiquette. Silverware is usually rolled into a napkin on a buffet line, because it's easier to carry to the table while also carrying a plate of food. 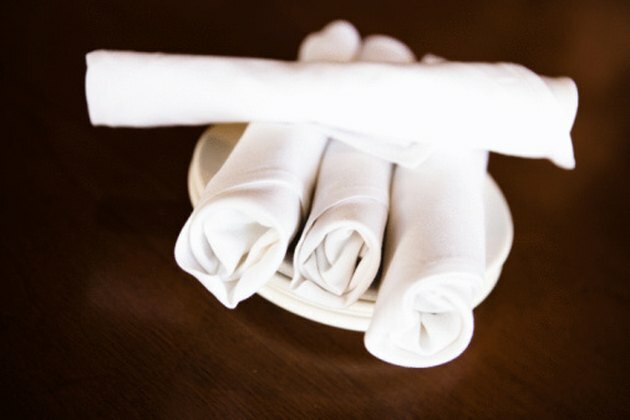 However, in some instances — a restaurant table setting, for example — rolled silverware is the norm. In this instance, it's best to follow some of the rules from both the formal and informal sides of table setting. When setting a table with rolled silverware, follow both the formal and informal rules of table setting. Begin by taking a square napkin and folding it in half to make a triangle. Place the silverware inside the napkin with the knife on the bottom, the salad and the dinner fork on top of the knife, the soup spoon on top of the forks and the teaspoon on top of the soup spoon. Position the silverware in the napkin with the handles of the silverware facing the longest side of the napkin and the heads of the silver pointing up toward the point of the triangle. Fold the bottom half of the napkin up over the handles of the silverware. The napkin should cover about half of the handles. Fold one of the far corners of the napkin over the silverware, then the opposite corner. Roll the napkin tightly to enclose the silver. Set the dinner plate onto the middle of the place mat. Make sure it's centered, because the dishes, glasses and silverware will go on both sides of it. Place the rolled silverware on the left of the dinner plate. Position the glasses on the right. The water glass belongs on the innermost side next to the plate, followed by wine glasses and then champagne flutes. Set the salad plate on the left side of the silverware if you are serving salad separately. Put the bread plate on the upper left-hand corner above the silverware roll with the butter knife lying across it. Inform guests where they are sitting if this is a formal dinner by putting a place card on the dinner plate or just above it.